Various owners and tenants are mentioned relating to an earlier building which was damaged by fire in February 1900 after which the contents were auctioned off. Under the instruction of the 6th Duke of Portland the derelict property was demolished. A replacement house was built designed by Louis Ambler (architect) and constructed by Adam Eastwood. In 1954 the site was purchased by the Ministry of Health and was converted into a diabetic hospital. 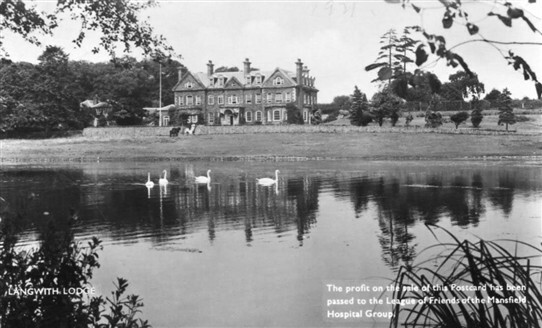 While the date this closed is unknown, the building is still used in looking after the well being of people. It has been a care home since around 1990 and on the web site www.carhome.co.uk/carehome.co.uk it is referred to as a splendid period residence occupying a beautiful setting on the edge of the village of Nether Langwith...It is set within its own delightful well kept and secluded grounds...with un spoilt countryside and an attractive lake. Those words could be referring to the postcard below. This page was added by Pauline Marples on 12/06/2017.